Fabric Vertical Blinds are generously decorative, come in a large classification of beautiful colors and patterns, and are made perfect for rooms where you need privacy, but want filtered lighting. These Fabric Vertical window coverings do an extraordinary job of regulating light and blocking out the sun. So your floor coverings, home furniture, and accessories are protected from the sun. 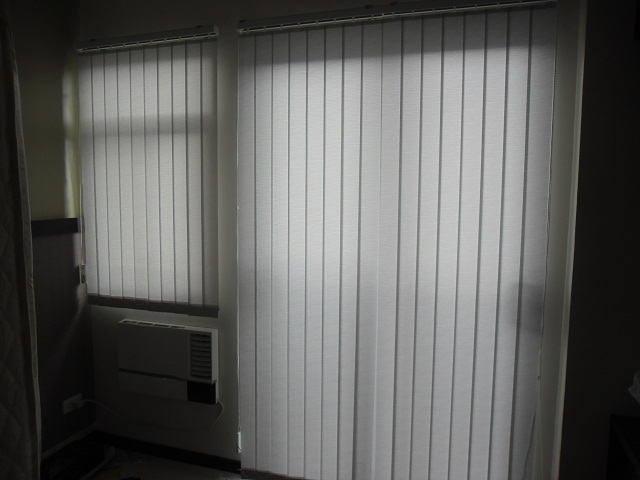 Our Fabric Vertical Blinds come with heavy-duty headrails, and are easy to install. Fabric Vertical Blinds are an excellent window treatment for large depiction windows and sliding glass doors. Fabric Vertical blade reduce dazzling light and are ideal for formal areas such as dining room and living area. 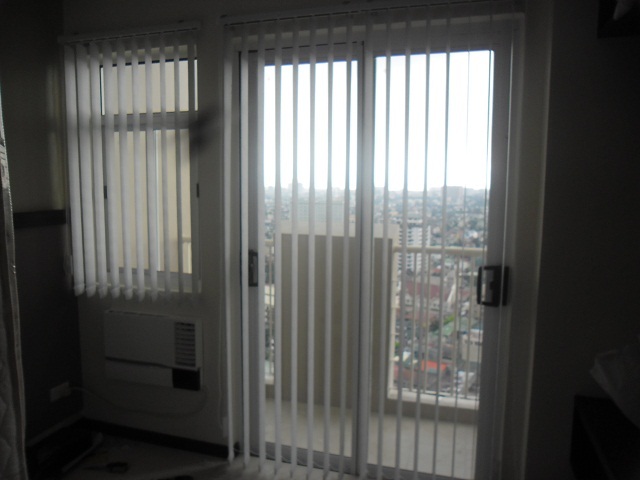 These photos were taken from one of our client in Trevi Towers in Makati City. She choose to have V 7598 Grey for her large deception windows for her to view those beautiful sceneries around her condominium. Different choices of colors and designs are available for fabric vertical blinds and DS Windows & Walls can provide for you a custom-made different sizes of window blinds according to your windows requirements. We offer free estimate and quotation within Metro Manila and charge the total fare expense outside Metro Manila. For your queries reach us at (02) 403-3262 or 0916-311-3909 , or email us at inquiry@dswindows.com. Feel free also to visit our kiosk at 4th floor of Waltermart Center, Makati City.